CIMBA is an exceptional opportunity for students at Western Michigan University and has become quite popular with WMU students in recent years. We recommend chatting with the many CIMBA alumni still on your campus for information about studying abroad in Paderno del Grappa. Complete the CIMBA online application. Be sure to include the short essay portion and your resume. Have an official WMU transcript sent to the University of Iowa Office of Admissions (adm-transcript@uiowa.edu). You must also complete the WMU Broncos Abroad application found at http://broncosabroad.international.wmich.edu/. To locate the correct application, search for Italy under the WMU Programs button, then select CIMBA, and then the APPLY button. All WMU students must meet with an advisor in the Broncos Study Abroad office to have an approval form signed in order to verify that they are approved to participate in any study abroad programs. Please contact Sarah Reid (sarah.reid@wmich.edu) in the Broncos Study Abroad office for details. 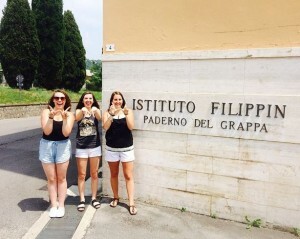 WMU study abroad often requires students to have a 2.75 cumulative GPA to study abroad. Students with a GPA between 2.5 and 2.75 may still be admitted and should speak with Barb Tomczak in the Global Business Center (see below) for details. If you are a US or EU citizen, you will not need to obtain a visa to study abroad, due to the length of the program being less than 90 days. However, if you are an international student, you will be required to obtain an Italian visa to study abroad with CIMBA. WMU provides specific instructions for their students who need to obtain a visa. Click here to review all necessary visa information. All CIMBA coursework is approved to transfer back to WMU. WMU students will retain a letter grade for their CIMBA coursework which will be calculated into the overall GPA. WMU has already determined the course equivalencies for CIMBA coursework. Please visit Barb Tomczak in the Global Business Center (see below) to determine your best course options and transfer equivalencies. The University of Iowa is the credit-granting institution for all CIMBA coursework. Transcripts will be available for request online at the conclusion of the program. No transcripts will be released until all program costs are paid in full. The WMU Haworth College of Business offers generous scholarships to all undergraduate and graduate business students participating in any HCOB approved study abroad program such as CIMBA. Contact the Global Business Center located in 2320 Schneider Hall or call (269) 387-5086 for information. Honors students in the Lee Honors College may receive honors credit for a variety of experiential learning options, including study abroad. Study abroad credits appearing on a student’s WMU transcript, including CIMBA credit, will be counted as honors credit, up to a limit of 3 credits per semester. Multiple study abroad experiences may count for additional honors credit with honors college advisor, associate dean or dean approval. For further information about study abroad honors credit, please contact the Lee Honors College at 269-387-3230.